A metric is a unit of measurement. It can be used in many ways. Analyzing the performance of your company and its employees is one of them. Nectar Desk uses real-time metrics like status history, the speed of call, time, total calls received, etc. This reporting feature is useful to recognize your best and worst liaisons. Thus, you can analyze your whole organization and maximize its potential performance. Nectar Desk’s call center analytics display various reporting metrics for every liaison. Number, time and speed of all calls taken are the most helpful ones. There are more properties of calls like inbound, outbound, answered, unanswered, and more. This provides a quick and easy analysis of every liaison’s operations and helps you give individual, statistical suggestions to every employee in your team. Agent statuses are shown in the liaison reporting dashboard of Nectar Desk. You can see if liaisons are available, busy, or offline. 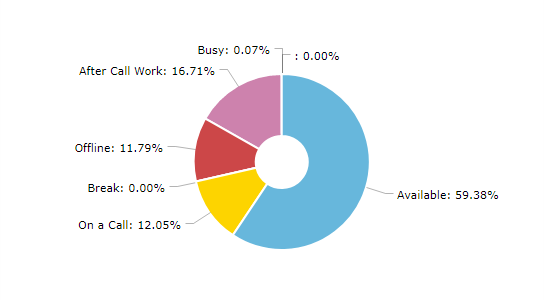 You can also check how much duration your team is spending on calls. You are also notified if any liaison is in training, on break, or offline. This helps you find out loopholes and inefficiencies operating contact center analytics. In this way, Nectar Desk helps you to manage time and operate your company more efficiently. Nectar Desk lets you view metrics and performance individually. Likewise, it also lets you view them in groups or sub-groups of call center liaisons within your team. These are termed as ring groups. Presets and configurations help you create and edit a ring group. Use the drop-down menu on Nectar Desk’s reporting dashboard. All of the information stored for that particular group will be shown on the dashboard. This is a simplistic and holistic approach for reviewing the working behavior and performance of every single liaison and also different liaison ring groups. Nectar Desk has a simple and useful dashboard application for mobile devices as well. The management at your call center will be able to track down data outside of your office as well. Nectar Desk stands for Call Center Agent Performance Analytics Dashboard smartphone application. It is also a flexible call tracking software that allows you to locate several call centers of multiple skillsets and departments. You can also recruit new employees through. Check availability and statuses of liaisons in your call center by utilizing Nectar Desk Agent Performance Analytics to its fullest.